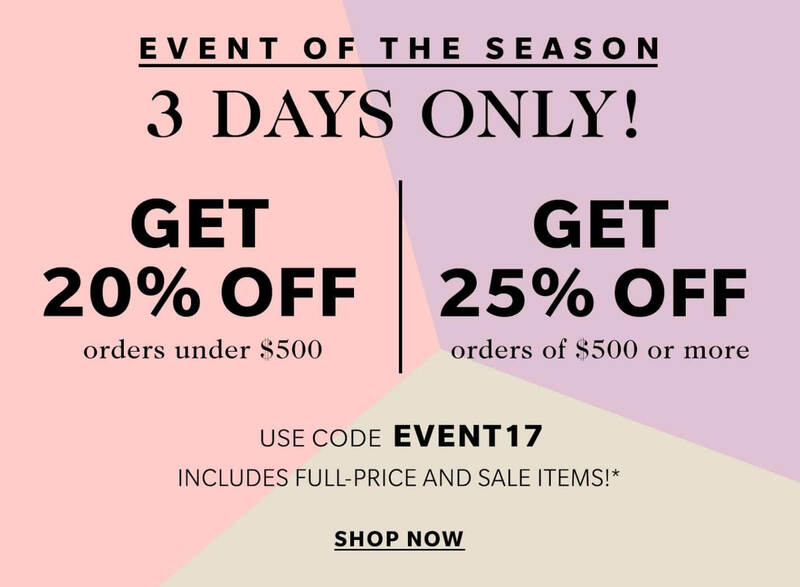 Shopbop – After Holiday Sale! I wanted to make sure all of you knew that Shopbop is having an amazing sale on their already marked-down items! By using the code JOY25, you can get 25% off any marked down item, making some items 75% off…that’s one way to spend that holiday cash! Above I have linked some of my other favorite pieces and check out the comments for why I am DYING to get my hands on. This is a little last minute, but don’t forget the sale ENDS TONIGHT at midnight, so get to spending and shower yourself with one more treat to celebrate 2017! I wanted to make sure all of you knew that Shopbop is having an amazing Big 17 sale for Spring! By using the code GOBIG17, you can get 15% off your entire order over $200, 20% off your entire order over $500 and then 25% off your entire order over $800 (view details here). Above I have linked some of my favorite pieces and check out the comments for why I am DYING over their new spring trends and arrivals. Or view their entire Shopbop website HERE. I wanted to make sure all of you knew that Shopbop is having an amazing Big 16 sale for Thanksgving / Black Friday/ Cyber Monday (pretty much the biggest sale time of the year)!! By using the code GOBIG16, you can get 15% off your entire order over $200, 20% off your entire order over $500 and then 25% off your entire order over $800 (view details here). I am so excited this event rolled around, because surprise, surprise, I have hardly started on Christmas shopping (even though during the last sale, I swore I was going to get ahead of the game and buy all my family stuff in October haha), so Mom and Sis, if you are reading this post, get excited because your gifts are on the way as of yesterday lol! Happy shopping darlings and make sure to stop by the sale before it end Monday, November 28th!